وجه العملة 3 رجال شرطة في هيئة هيكل عظمي و عصي مكافحة الشغب وعلى أهبة الاستعداد وعبارة "To Brutalize and Exploit"
3 رجال شرطة في هيئة هيكل عظمي و عصي مكافحة الشغب وعلى أهبة الاستعداد وعبارة "To Brutalize and Exploit"
1oz 2015 Slave Police Silver Proof-like Round Many in the Western world today are questioning the way in which the modern police force has evolved. From an institution that offered protection, security and the feeling that all members of society would be treated justly by them, many citizens now question what the ultimate goal of the police in our society is, and whom they actually serve. This is not a new question, and was addressed by Juvenal 2000 years ago with his famous phrase "Quis custodiet ipsos custodes?" This literally translates as "Who will guard the guards themselves", but can be expressed today as "Who will police the police"? This subject troubled both Socrates and Plato philosophically as they debated how those in authority can be held to account for their actions. The reverse features three skeletonized police officers in full riot gear with bats at the ready. The skeleton represents the dehumanization of today's police officers as an element of state control. "Police State" is emblazoned on their chest in case any are unaware of the direction we are heading. 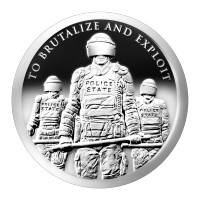 The traditional Police motto of "To protect and serve" has been adapted to today with the words "To Brutalize and Exploit" found at the top of the round. The obverse has the Silver Shield logo with the trivium in the centre encircled by the words "Silver Shield 1 Troy ounce 2015 999 Pure Ag" surrounded by 47 bullets. The 47 bullets represent the atomic number of silver. This round carries a powerful message, and would make a mind-opening gift for those who have yet to wake up to the realities of today's state of affairs.